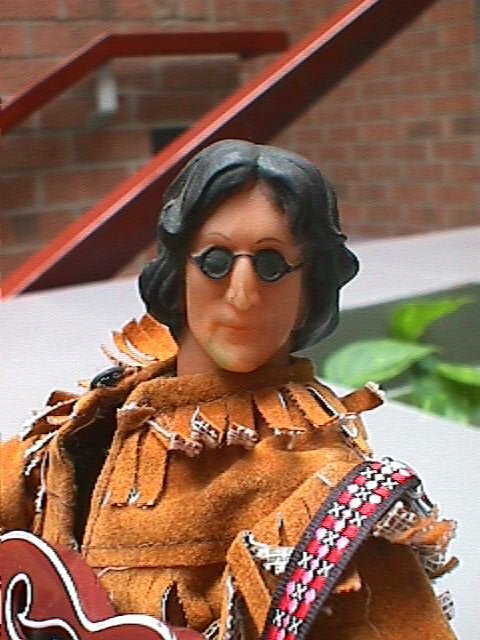 As I originally received him, John was the head from a "John Lennon Figural Radio" on the body of an old Gabriel "Lone Ranger" figure from the mid 1970's. The costume was probably some sort of "Wrangler" promotional outfit, probably from a "Ken" doll. The white "turtle-neck" was in fact a white jumpsuit with yellow trim, worn backwards. 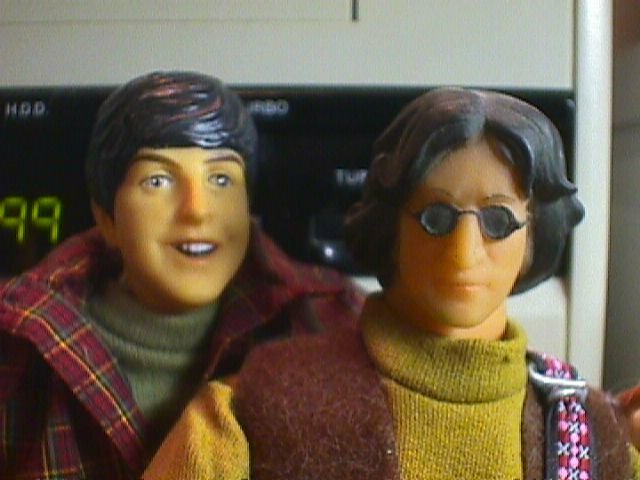 It gave John a sort of stiff, padded look I didn't care for. 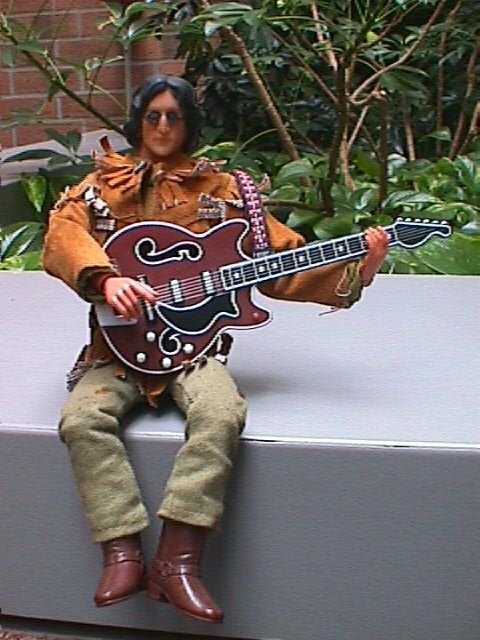 The body was also a bit immobile, and too chunky and pear-shaped for the Lennon who was described in the days he's portrayed in here as "whippet-thin." 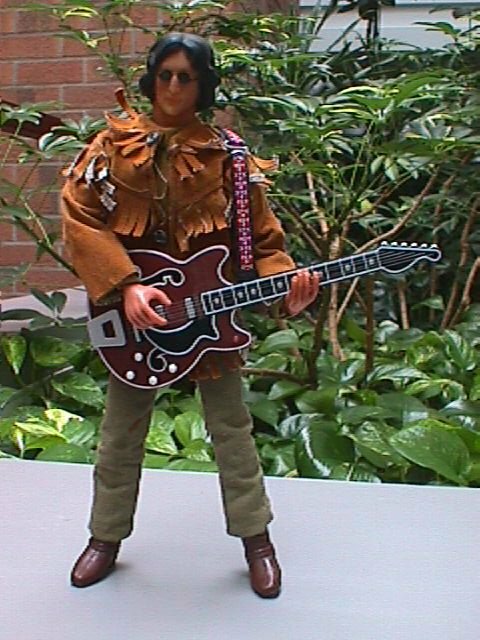 When one of John's hands broke off, I ended up searching eBay for another "Lone Ranger" figure I could use for parts. 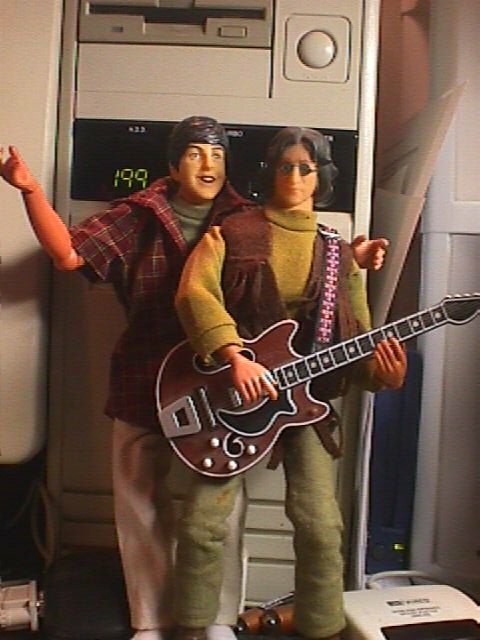 When I got one, it came with an old "Jay J. Armes" figure, minus the hand my Lennon had left, so I took it as a sign that a body-swap was in order. 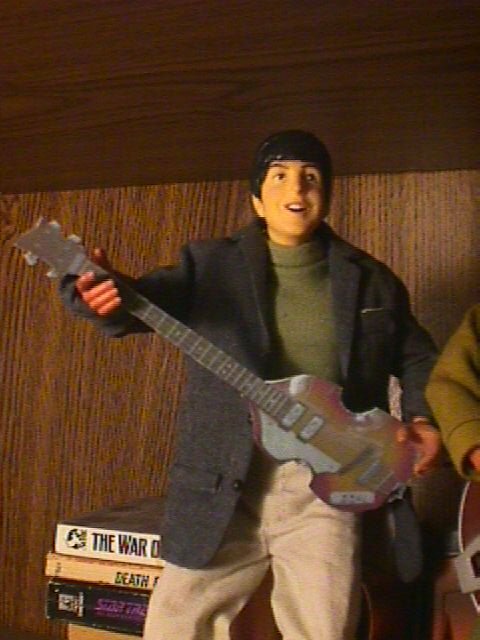 The central upright elastic from the "Armes" body was nearly broken, and the neck post was wrong to accept the Lennon head. I broke the rubber band, and then removed Armes' neck post, and hollowed it to a socket, and put the Lone Ranger neck post over it. I then took a few inches of Stretch Lycra (as I didn't have an appropriate elastic available) and strung it from under the rubber band between Armes' legs to the slot at the bottom of the neck post, and tied it under tension. The package that had contained Armes and the Lone Ranger figure also contained some random, appropriately-sized clothing. 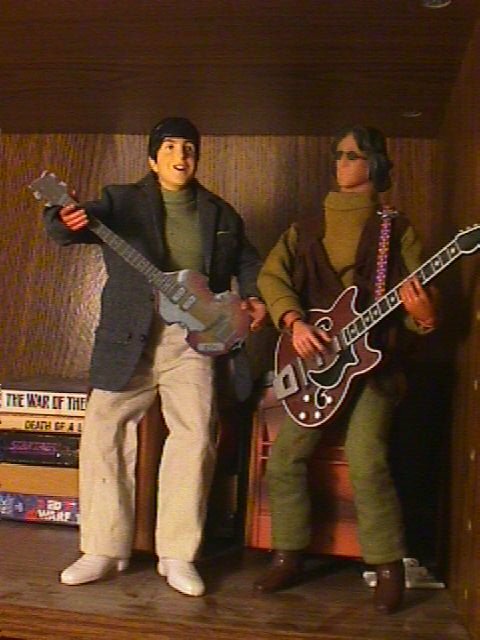 With it, I gave John the outfit he wears now: Green slacks, a green jersey, and a fringy "suede" jacket that almost certainly used to be Tonto's, and Armes' boots.